If Newton, Iowa, isn’t in the middle of nowhere, it’s at least in the same zip code. I mean, it’s a good 40-mile drive from Des Moines, much less any other outpost of western civilization. But boy, do they love their open-wheel racing up in the land of corn and John Deere, and that’s good enough for me. 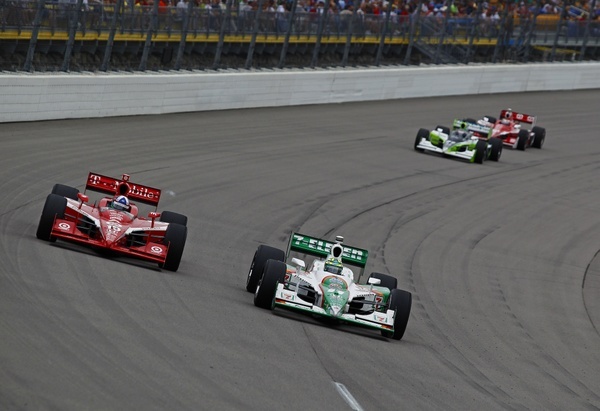 At just under a mile, Iowa Speedway is a genuine short track, the only one on the IZOD IndyCar Series schedule this year. I do wish it was a bit flatter. Steep banking helps big, lumbering stock cars heave their overweight, under-tired selves around the corners; but all it does for IndyCars is pin them to the track. Still, I’m just grateful to have at least one short track left where fans can marvel at the speed and raw energy of an IndyCar at full song. Sunday’s Iowa Corn 250 was not only the best race of 2010, it was one of the most combative and competitive shows in recent memory as almost 35,000 people (about 85-90% capacity, despite some reports to the contrary) were treated to a pass-happy 250 laps and one long overdue, heck-of-a-drive by Tony Kanaan. Of the 17 lead changes, all but one came at speed and on track – not in the pits. 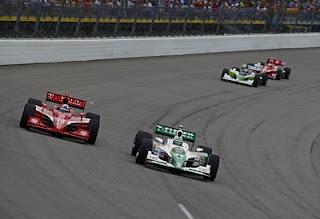 Teammates Dario Franchitti and Scott Dixon battled each other for first place like their jobs were on the line while Kanaan and Franchitti went side-by-side and swapped the top spot five times in 25 laps. It was just a GREAT RACE. Dario’s undefeated streak at Iowa (he won in 2007 and ’09) came to an end when gearbox failure set him to the pits for a long stop. 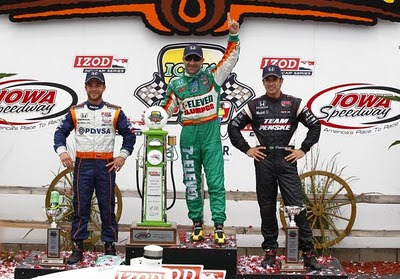 That took him out of the picture, but Helio Castroneves stepped in and became Kanaan’s strongest late-race threat….until the last 10 laps, when TK REALLY stepped it up and pulled out to a four-second margin of victory and his first win since – wait for it – Richmond in 2008! Rounding out the top three was E.J. Viso, finally providing KV Racing with a ray of sunshine among the “festival of carbon fiber” that all-too-often has summed up the team’s season. 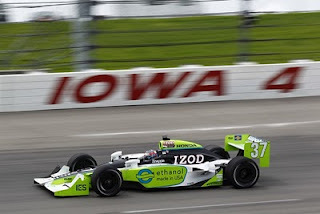 It also was E.J.’s career-best IndyCar finish and maybe, just maybe, made up a little bit for teammates Mario Moraes (an innocent victim in Justin Wilson’s first-lap spin/crash) and Takuma Sato (who once again was mega-fast, but once again stuck it in the fence mid-race). Good day. Great race. But after four ovals, this old road racer is ready to head to Watkins Glen for the start of the July road-course swing. Alex Lloyd had a decent run to 13th, especially considering he was coming off surgery to remove his appendix during the week leading up to the race – but he shouldn’t expect a Christmas Card from Sarah Fisher this year. She was most displeased after being pushed off line (her belief), onto the marbles and into the Turn 4 fence on Lap 92. Hideki Mutoh, who’s had great runs (including a second-place finish) here in the past, had a weekend from hell instead this year – starting with a crash over the infamous Tunnel Bump in testing the week prior to the race. The team parked him during the race after he struggled all through practice, qualifying and the race. The week before Iowa, Tony Kanaan had a blast running a “late model” dirt-track car in Tony Stewart’s annual “Prelude to the Dream” charity race at Eldora Speedway. TK said he’s already looking forward to coming back next year. Graham Rahal was “Driver of the Week”, substituting for the injured Mike Conway at Dreyer & Reinbold Racing. Tomas Scheckter was the sub at Texas, and the ole’ Chrome Horn himself, Paul Tracy, will sit in at Watkins Glen before moving over to KV for Toronto and Edmonton. One of the more unique calls to start engines came from Tim Burrack, chairman of the Iowa Corn Promotion Board: "Drivers, please start those no-tar-ball, corn-ethanol engines!" And on that note, we’ll close this one out. See you again after the ‘Glen.